From Tales to Astonish #90 ©1967 Marvel Comics. ART BY GIL KANE. Picture a gamma-spawned monstrosity mightier and more hideous than the Incredible Hulk— this is the Abomination. In Tales to Astonish #90 (1967), in the story “The Abomination!” by Stan Lee and Gil Kane, Slavic spy Emil Blonsky infiltrates a U.S. military base to filch the technology that transformed scientist Bruce Banner into the Hulk. He activates Banner's gamma device and is immersed in radiation, instantly transmogrifying into an emerald-hued grotesquerie capable of heaving 100 tons, shrugging off artillery fire, and hurdling two miles in a single bound. The Abomination is much more than the Hulk's evil twin. 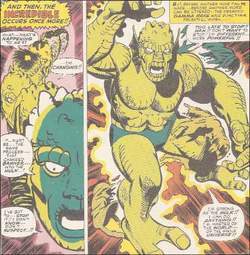 Banner's Hulk transformations are triggered by rage, after which he returns to his human self, but Blonsky's metamorphosis is permanent. While Banner's intelligence fades when he morphs into the Hulk, Blonsky's faculties are fully intact, although his judgment is routinely clouded by his unbridled hatred of his jade-jawed foe. The most discernable difference between the two is the supervillain's appearance: with his repulsive reptilian hide, Blonsky is unmistakably an Abomination. The supervillain's appellation was greeted with trepidation amid the Marvel Comics Bullpen, Stan Lee recalled in the trade paperback Bring on the Bad Guys (1976). “The Abomination is a lousy name for a villain!” scoffed one staffer. Lee stuck by his guns; “I had had it up to here with names like The Purple Potato or The Living Bedspread,” he wrote. In the character's debut, the behemoth's name was coined by Banner's girlfriend (and later, wife) Betty Ross, daughter of Hulk-hunter General “Thunderbolt” Ross, who gasped, “Who … or what … can that abomination be?” Fueled by ego and ire, the Abomination has repeatedly gone monster-to-monster with the Hulk. His menace has not been relegated solely to Earth: during a series of intergalactic adventures, the Abomination left such a trail of annihilation in his wake that he was dubbed “the Ravager of Worlds.” The Hulk's private world was ravaged by the Abomination's most decisive coup: his murder of Betty Ross Banner by gamma-radiation poisoning. The rancor between green-skinned goliaths has intensified over the years, with Banner engaging in a tryst with Blonsky's estranged wife, Nadia. The acrimonious Abomination's acclaim in the 2000s includes his own miniseries, deceptively titled Hulk: Destruction (2005), written by popular Hulk scribe Peter David. The Abomination's grudge match with “Ol' Greenskin” has also burst into non-comics venues. Voiced by Richard Moll of Night Court fame, the supervillain appeared in UPN's The Incredible Hulk animated series (1996–1999) and has been converted into action figures by Toy Biz. The young-adult novel The Incredible Hulk: Abominations by Jason Henderson (1997) features Blonsky, as does Game Boy Advance's The Incredible Hulk (2003). The Abomination is the rumored villain to appear in the sequel to the 2003 live-action Hulk movie. No matter the medium in which the Abomination/Hulk battles take place, heaven help the person—or city—that stands in their path when these titans clash. The abomination of flowers, or representations of well-known objects of any kind, should not be endured within the limits of Christendom. In truth all that night had been the abomination of desolation to me. Though it was faint and low, it moved me more profoundly than all that I had hitherto heard of the abominations behind the wall. What her answer really said was: "If you lift a finger you'll drive me back: back to all the abominations you know of, and all the temptations you half guess. There's a choice of three great titles: The Abomination by Jonathan Holt, A is for Alibi by Sue Grafton or If You're Not The One by Jemma Forte. Former South African president Nelson Mandela said yesterday: "She continued to make us proud as she used fame to focus attention on the abomination of apartheid. Do they intend only to protest against the abomination, as is required, or do they intend to rally without restraint and with full devotion? The papal apologists at The New York Times expressed surprise in their article on the encyclical that the Pope did not denounce the abomination of gay marriage. In response to the pedophilia scandal, Benny the Dict ordered up "apostolic visitations" (Aramaic for "Inquisition") to American seminaries to purify them of the abomination of homosexuality. Once one house breaks cover and strings a line of fairy lights along the drive, it becomes a case of keeping up with the Joneses -- it's not long before the abomination of a life-sized illuminated Santa complete with ho-ho-ho sound effects is seen dangling from a home in your street. The A Consulting Team, Inc.